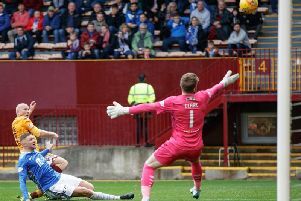 Returning Motherwell ace Chris Cadden inspired the Steelmen to a fifth consecutive home win in Saturday's 3-0 success over St Johnstone at Fir Park on Saturday, writes Craig Goldthorp. Cadden - on as a 63rd minute substitute for Jake Hastie with the score goalless - added some much needed verve to the 'Well attack and was instrumental in the victory. 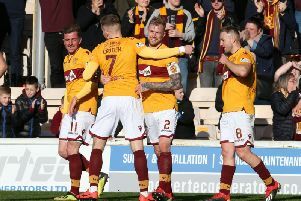 All three goals - by fellow sub Elliott Frear, David Turnbull and Richard Tait - move Motherwell up to seventh place in the Scottish Premiership and five points behind sixth placed Hibs with two games remaining until the split. The second half thrills and spills were in sharp contrast to the dull first half in the Fir Park sunshine, which saw Richard Foster shoot wildly over the bar from long range for Saints early on. Home defender Tom Aldred then volleyed too high from a David Turnbull corner as the Steelmen retaliated. The low key opening then saw the visitors' Scott Tanser scuff a left footer wide from outside the box. But the game exploded to life on 13 minutes when Saints were awarded a penalty after Chris Kane went down in the box. The award by referee Euan Anderson looked soft, as it appeared that Kane had gone down after colliding with a team-mate. But justice then seemed to be done as home keeper Mark Gillespie dived low to save Liam Craig's weak effort from 12 yards. Fir Park winger Gboly Ariyibi has consistently been a stand-out since joining on loan from Nottingham Forest in January and he was again to the fore with some first half sprints down the left flank. St Johnstone's Murray Davidson then received a 28th minute booking for a crude foul on home midfielder Alex Gorrin. Jason Kerr's long diagonal ball into the Motherwell box on 38 minutes fell into the path of Sean Goss, whose weak effort was straight at Gillespie. The second half started with an early penalty appeal for Saints but whistler Anderson quite rightly waved away the appeals after Matthew Kennedy went down under a Grimshaw challenge. The best chance of the game so far arrived for the visitors on 52 minutes when Kane volleyed over from point blank range after Goss's diagonal free-kick had been headed across goal by Jason Kerr. And the miss was to prove key in how this game went. For substitute Frear soon sent a left footed effort just wide after fellow sub Cadden's ball forward had been back heeled by Aldred. Scotland international Cadden then made a positive contribution again when his fine crossfield ball picked out Allan Campbell whose goal attempt was blocked. But Motherwell did go ahead in sensational style on 70 minutes when Frear struck home brilliantly with his left foot after fine build-up play involving Dunne and Main. And the hosts doubled their lead on 80 minutes when Turnbull shot in emphatically after a Campbell pass. It should have been 3-0 on 85 minutes following a swift Motherwell breakaway, which culminated in Frear shooting just wide. But the scoring was rounded off a minute into injury time when captain Tait shot home from a tight angle. Motherwell: Gillespie, Tait, Aldred, Campbell, Main, Ariyibi (Frear 63), Grimshaw, Dunne, Gorrin (McHugh 76), Turnbull, Hastie (Cadden 63).